suitable age:- 4-10 years, 2.load capacity:- under 25 kgs, 3. speed:- 2 km/h, 4.charger:- input: depend on local voltage output: dc 6v500 ma, 5. charge time:- 8-12 hours, 6.bettry:- 6v 4ah x1, 7. power way:- charging type, 8.average bettry life:- approximately 300 times, 9. fuse:- 5a.. 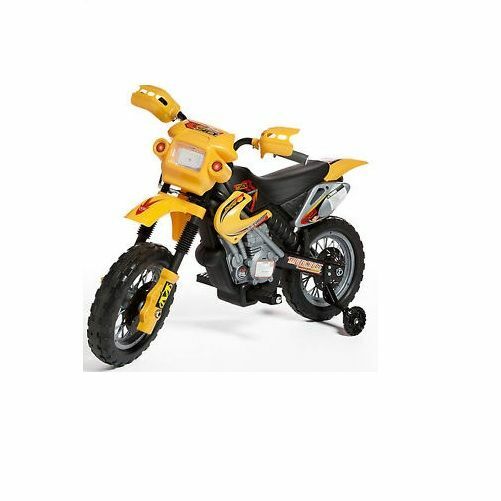 This Battery Operated Kids Bike Motocross Bike will bring excitement to every kid's play time. 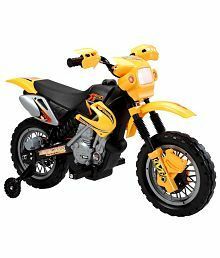 Your little one will enjoy riding around in this battery operated Motocross Bike Ride-On. Fully enclosed chassis and easy to assemble. Side support wheels are provided for learning the bike. How does It Work There is a forward and backward switch provided to move the vehicle forward. Ride-on has inbuilt battery which needs to charged with provided adapter for around 8 to 16 hours. Features Battery Operated Realistic Look Attractive Graphic Easy to operate and Fun to ride. 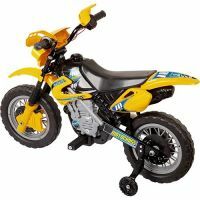 High-quality plastics Rugged and Durable Switch controlled forward and backward movements Care & Warnings Children must be under adult supervision while riding this Ride-on. Note : The product will be delivered in un-assembled form adult assembly required. Bike Body, Handle Bar, Front Fork, Wheel Cover, Front Wheel, Side Wheels, Face Guard, Dashboard, Shock absorber, Foot board, Charger.